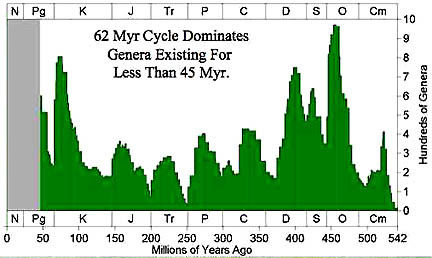 Graph of Earth life genera (genus of species) declining on a cycle of every 62 million years for the past half billion years. Graphic © 2005 by Richard Muller, Ph.D.
Apri1 1, 2005 Berkeley, California - Whatever humans do, or don't do, in this century to help sustain the Earth's ecosystem, it appears that our planet has endured some kind of assault every 62 million years which kills marine life all over the world. The last big global catastrophe is definitely linked to the impact of a large asteroid near the Yucatan Peninsula in the Gulf of Mexico 65 million years ago. About 75% of all living creatures in the oceans and on land were literally wiped out to extinction, including the dinosaurs. Could there be a 62-million-year cycle of asteroids, comets or other cosmic debris that affects our solar system and Earth? Or is it fluctuations in our Sun? Or the periodic volcanic violence of our own planet? Or something else?